OK. It's less than 2 weeks until Hugglets, and I am busy creating new teddies for the big day. Just a quick post to show you Bertie. His design is a fusion of my realistic and whimsical teddies. 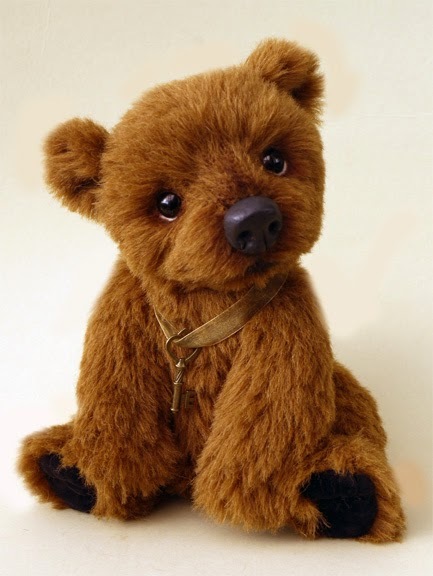 He is made from beautiful chestnut Steiff Schulte alpaca and has cashmere, pulled toes. I hope to post a few more teddies as previews before September 14th. I am in the main hall - 34. Please come and say hello! Wonderful! So happy to see your teddies again! Aww, gorgeous wee guy, hope it goes well! Thank you, Katy! I've been virtually living in my workroom for the past month. The world seems to have managed without me! :) I'm looking forward to catching up on all the blog reading I've missed after Hugglets. Cute Teddy bear, such a dazzling eyes! This is a perfect gift for kids who loves teddy bear.